The negative effects of too much sugar are well documented. As a result of this, a commentary published in Nature asserts that sugar is just as toxic as tobacco and alcohol, and the government should step in to regulate its consumption. The report also mentions that sugar consumption has tripled around the world in the past 50 years, a large contributor to the obesity epidemic. Apparently there are 30% more obese people in the world than there are malnourished people. That’s an unsettling statistic. If you’re wondering how sugar can compare to these non-food items that affect the way our minds and bodies work, it’s pretty easy to figure out. Sugar can be toxic, because there is potential for abuse, and excessive amounts of it can negatively affect public health. So many processed foods have sugar added right in that many people eat as many as 500 calories a day in added sugar alone, many without even realizing. Aside from this, apparently sugar triggers the same areas of the brain as alcohol and tobacco, encouraging excessive intake and cravings. It’s easy to peg obesity as the main cause of these diseases, but the report shines light on the fact that people within a healthy weight range are also developing hypertension, diabetes, heart and liver disease, and lipid problems. 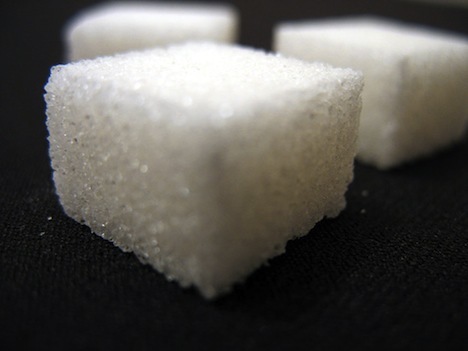 Because of this, the authors believe it’s time for the government to step in and impose taxes, age restrictions, and other policies to control the distribution and consumption of sugar. “We are confident that the American people are perfectly capable of choosing what foods to eat without stark regulations and unreasonable bans imposed upon them,” the association said in a statement. Hmm, it sounds like diet-related disease statistics are telling us otherwise, what do you think? When all the facts about each product (tobacco, alcohol, sugar) are simplified and looked at from an objective perspective, it doesn’t sound like too much of a stretch to compare the three, does it? Do you think this would be going too far, or would you be happy to see government restrictions on sugar? I wouldn’t mind seeing this, even if grade schools are tackled first, to limit the amount of sugar consumed by children. I’d be tempted to see this as a couple of steps down the slope of abrogating personal responsibility to state control. Oh, I can see where the point is coming from, and that where to draw the line is a legitimate discussion point, but it is a discussion that we need to have. I mean, if we let them regulate sugar intake, what arguments do we use to stop them from regulating the consumption of dihydrogen monoxide? Definitely good points, but I think it’s a little more complicated than that. You could also say it’s about government preventing corporations from having too much control over what we eat. Let’s face it, most food is produced by big corporations, and increasingly, it is using more sugar and salt, additives etc. You have to go out of your way to find food that doesn’t these days. Certainly there’s a big individual responsibility to take care and control of your own self, but at what point does the government help to regulate to improve, or even maintain, public health? As an extreme example, if there were not regulations, what would be to stop companies putting addictive elements into certain foods to keep people going back for more, and not labeling it. Oh no, corporations wouldn’t do anything like that for increased profits, would they? There is a balance to be struck. Previous post: Could Cimate Change Be Bringing Colder Winters To Europe?